Like the serene stone Buddha, meditating by the pool at Villa Azzurra, frazzled and fraught parents can rediscover a little inner calm in this Puglian sanctuary of tranquilty. For owners, Allegra and James, the villa is their dream come true of creating a retreat for themselves and their three children that others can enjoy as much as themselves. Allegra’s professional expertise as a stylist is obvious in the light and airy minimalist interior design throughout, of white walls, cream stone archways and smooth limestone floors which helps keep the place cool as summer temperatures soar. In the rare, colder months, a modern fireplace is right at the center of the spacious, open plan living room, dining room and kitchen so families can feel nice and cosy while relaxing on the big squashy sofas or sitting down to dinner. Besides the formal dining table, the kitchen has a sizeable breakfast bar where babies and toddlers can munch on a chunk of foccacia in the high chair provided while mum or dad rustle some ‘little ears’ pasta. 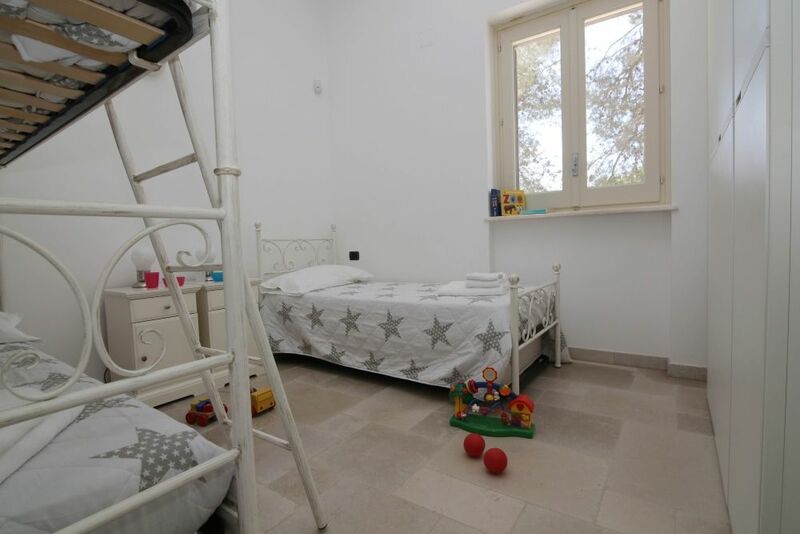 Villa Azzurra is all on the ground floor, so there are no steps or stairs indoors to worry about and listening out for babies in the bedrooms is that bit easier. 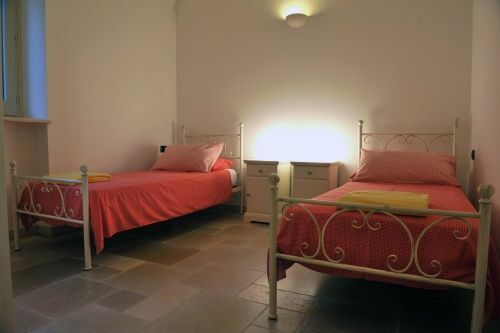 There are four spacious bedrooms in all, comprising two double bedrooms, one twin room and one child’s triple. 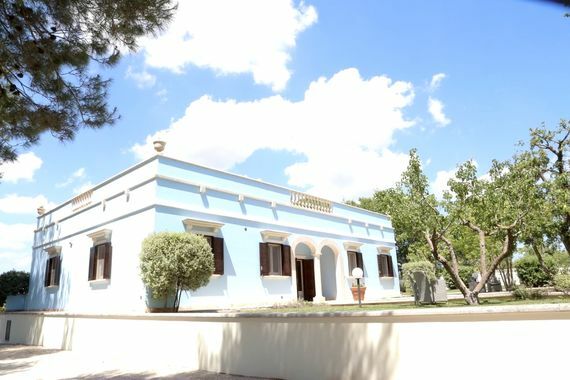 The two doubles have luxurious ensuite bathrooms with twin sinks and walk-in showers, plus the villa has a family bathroom and a separate WC. 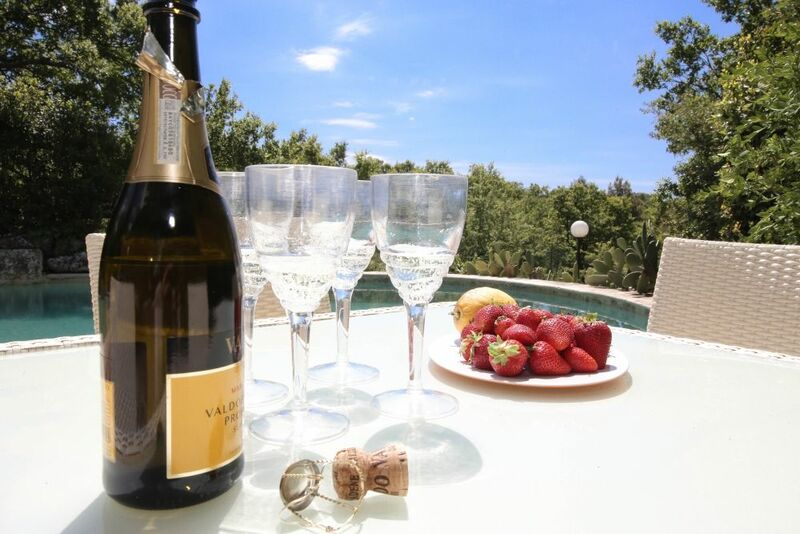 The garden surrounding the villa is a secluded oasis amongst citrus trees, fig trees and a private, Mediterranean woodland. The focal point is a fabulous 20x10m pool, which has been designed to compliment its surroundings amongst the trees and is like stumbling upon a sparkling lake. 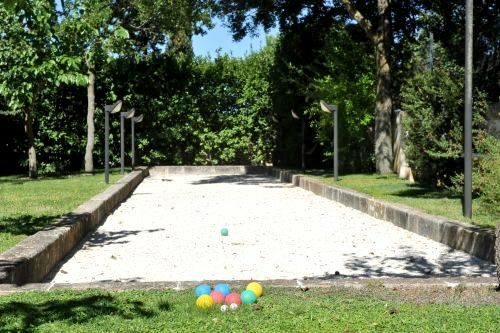 Besides relaxing by the pool, families can play table tennis or boules on the ‘bocce’ pitch and stoke up the barbecue on the dining terrace for leisurely evenings as the stars come out. If parents don’t feel like cooking, homemade meals with 48 hours notice. To help grown-ups relax even more, private yoga classes and shiatsu massage can also be arranged at the villa, as well as pottery workshops and cookery lessons, to learn how to make the most of the renowned Puglian produce. 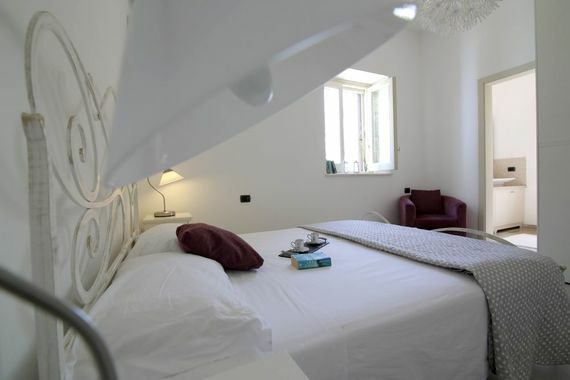 Villa Azzurra sleeps up to 9 people, plus a baby in the wooden cot provided. 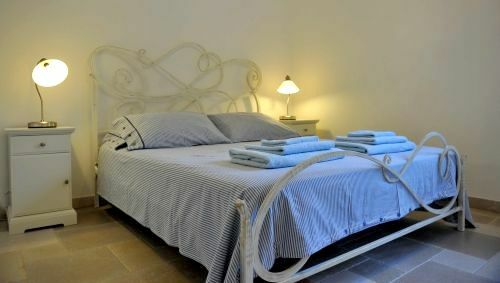 Two double bedrooms both have space for a cot and both have luxurious en-suite with double sinks, walk-in shower and wc. Bedroom 3 has twin beds and is opposite the family bathroom, while bedroom 4 is ideal for children with bunk beds and a single bed, next to a separate WC. All linen and pool towels are provided. 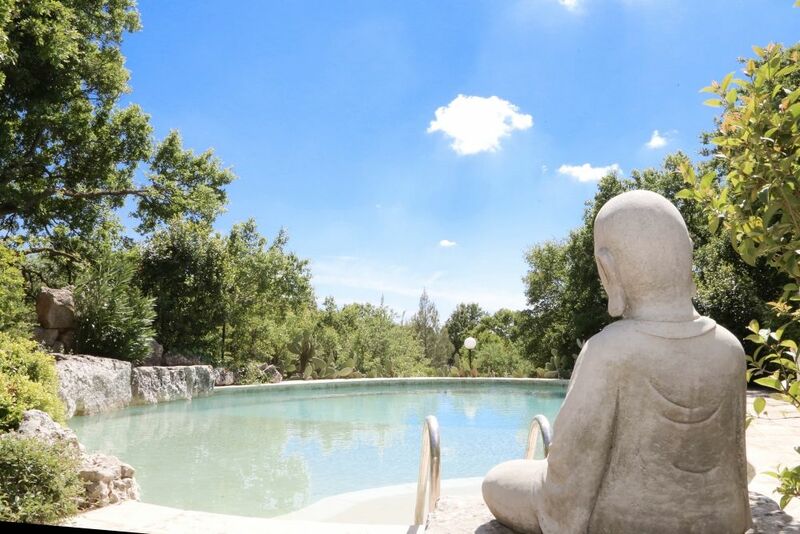 In the unspoilt heel of Italy, Villa Azzurra is tucked away in the Itria Valley of Puglia, between the ancient towns of Cisternino and Martina Franca. The rolling green valley is crisscrossed with winding country lanes, vineyards, almond and olive groves, and scattered with the distinctive circular ‘trulli’ buildings with pointy conical bee-hive like roofs. No visit to Puglia is complete without peaking inside a few trulli and Alberobello is the tourist capital of trulli country, with literally hundreds of them, including many converted into artisan workshops, gift shops and trattorias. 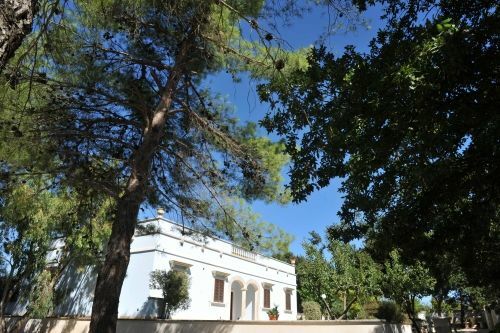 Villa Azzurra is just a few minutes’ walk from the nearest restaurant and the beautiful old towns of Cisternino and Martina Franca are just 10 minutes drive, with plenty of shops and restaurants to try the renowned local produce and fine wines. Also within 10 minutes drive is the ‘White City’ of Ostuni, perched high on a hilltop near the coast and boasting many excellent restaurants with amazing sea views. Puglia is famous as a foodies’ paradise because so much of the finest fresh produce used in Italian cooking comes from this region, from the fresh vegetables and olive oil to superb fish and seafood. Orecchiette pasta, which means ‘little ears’ because of its shape, is a deliciously simple Puglian speciality and the variety of foccacia breads are perfect for picnics. Besides the fantastic food, Puglia is famous for its coastline, being bordered by both the Ionian Sea and the Adriatic (25 minutes drive). The coast switches between craggy headlands, sea grottos and some of the finest beaches in Italy, including the unspoilt beach within the nature reserve of Torre Guaceto. 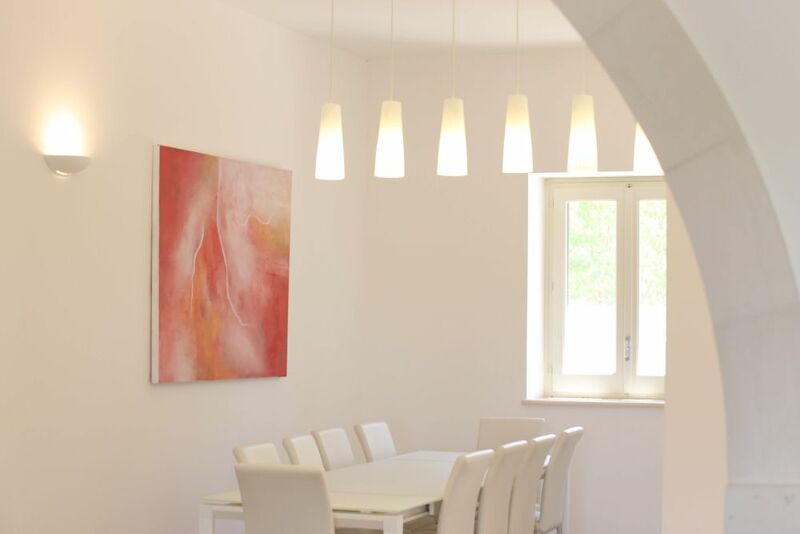 Nearest Medical Services: Hospitals in Cisternino and Martina Franca. 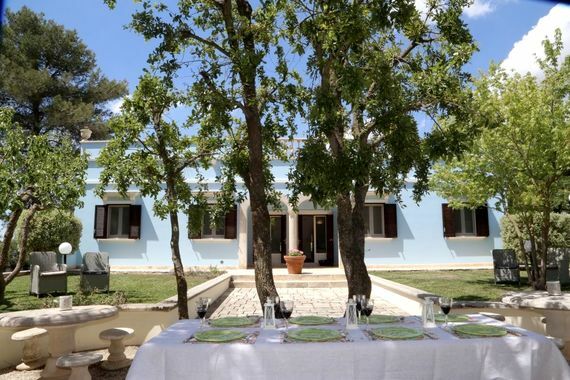 Getting There: Villa Azzurra is 45 minutes’ drive from Brindisi and 80 minutes drive from Bari, both of which are served by direct flights with RyanAir from Stansted Airport or British Airways from Gatwick. Allegra and James always had a dream to own a villa in Italy. As soon as they saw Villa Azzurra they knew it was for them but it wasn't in the condition it is today. Set in beautiful woodlands surrounded by olive groves, wild flowers and beautiful vistas, Villa Azzurra, formerly an agricultural school, had been converted into 4 separate apartments and needed some tender loving care. Allegra and James contracted a local architect and between them turned the villa into the beautiful contemporary 4 bedroom, single floor, open plan holiday home it is today. Why do we love it? What's not to love?! The roof top, where we can enjoy a glass of vino whilst watching the sunset over the Puglian countryside, the large pool built with natural stone and surrounded by fields and woodlands, the outdoor (and indoor) eating spaces where during the day you can sit under the shade of a tree with up to 10 friends or by night look up at the sky and see so many stars while the cicadas play their nighttime songs. The children laughing as they climb the trees or jump into the pool or us all playing a game of table-tennis, going for family bikes rides down the bike path (literally running parallel to the villa) before jumping into thelarge walk-in showers and getting ready to go out for an evening and enjoy some of the local culture and fare. The locals who love to share their experiences and adore children, the restaurants which produce food to die for and as a region is famed throughout the whole of Italy or maybe it's the blue flag beaches a mere half hour's drive away. The list goes on and on! Sleeps 6 + Infants 1 x queens bedroom, 1 x double bedroom, 1 x twin room and 1 x bunk bedroom with a pull out bed. Villa Azzurra is 45 minutes drive from Brindisi and 80 minutes drive from Bari airport. There are sandy beaches within a 30 minute drive. There is a local restaurant within walking distance and a selection of cycle paths. The owner can arrange bike hire on request at additional cost. 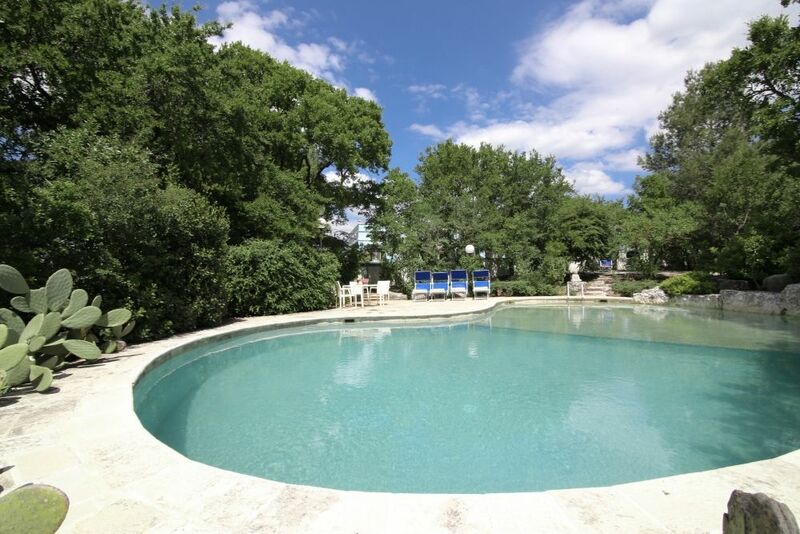 A beautiful pool with terrace area and sun loungers, pool towels are also provided. Can be arranged with the house manager. 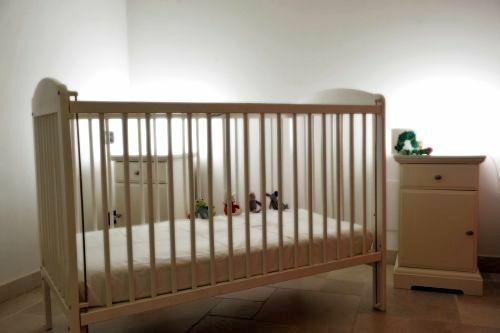 1 wooden cot, linen, highchair, potty, baby monitor and plastic cutlery, crockery and sippy cups. General toys and U rated DVDs. Buckets and spades for beach days. The villa is all on one level. 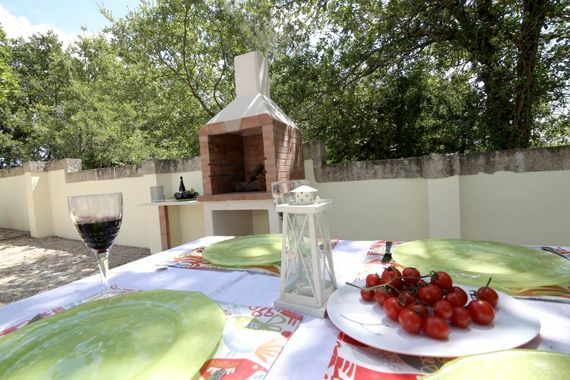 Private enclosed garden with BBQ. 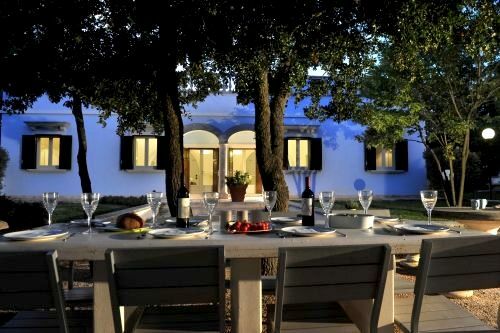 We stayed at Villa Azzurra for 2 weeks and we loved it. 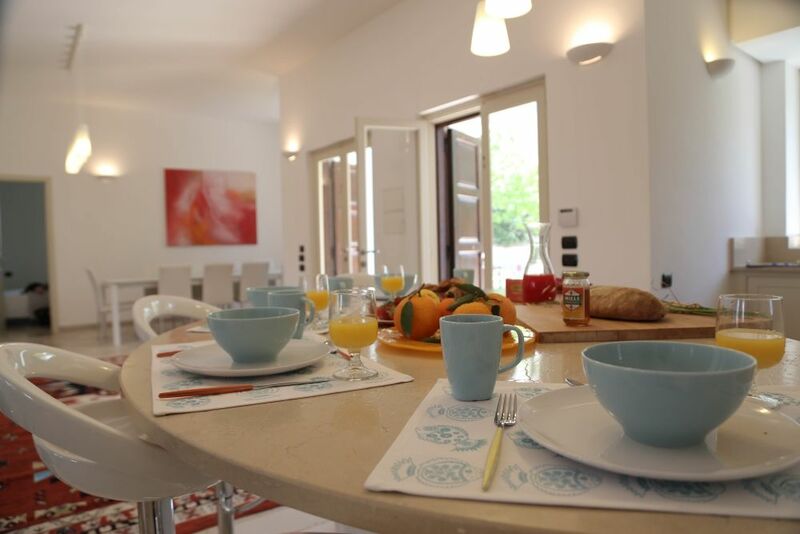 The villa itself is wonderful - large and modern, with plenty space inside and out to cook, eat, drink and relax. The pool is great too. It's in a separate, walled off area which was great given we had young children with us. 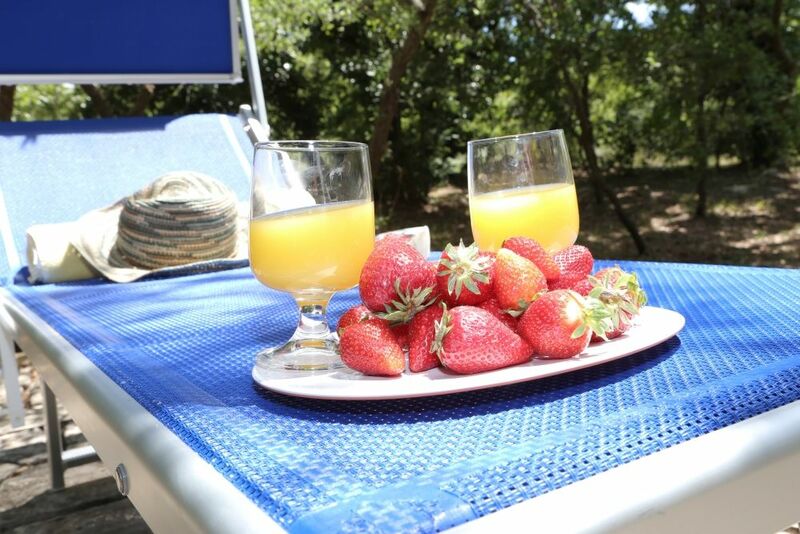 As another of the reviews says, the pool area loses the sun around 4pm so we enjoyed mornings and early afternoon by the pool, and moved up to the outdoor eating area or explored the local area afterwards. There are lots of shaded areas too, so anyone who isn't a sun seeker or very small children (we had both) can still enjoy the outdoor areas. Children are really well catered for - lots of plastic plates, bowls, cups and cutlery, games and toys, highchair, potty and a cot. Allegra even arranged for an additional cot to be there on our arrival for the small extra cost of £25. We also saw that although other reviews mentioned a lack of baths had been a problem for those with small children, a baby bath has now been added to the range of child-friendly paraphernalia so the shower-only situation wasn't a problem for us. It's worth bearing in mind that the villa doesn't have aircon but perhaps this is not unusual in Puglia. There are a number of large portable fans in the villa, which were a godsend - but it still gets pretty warm. 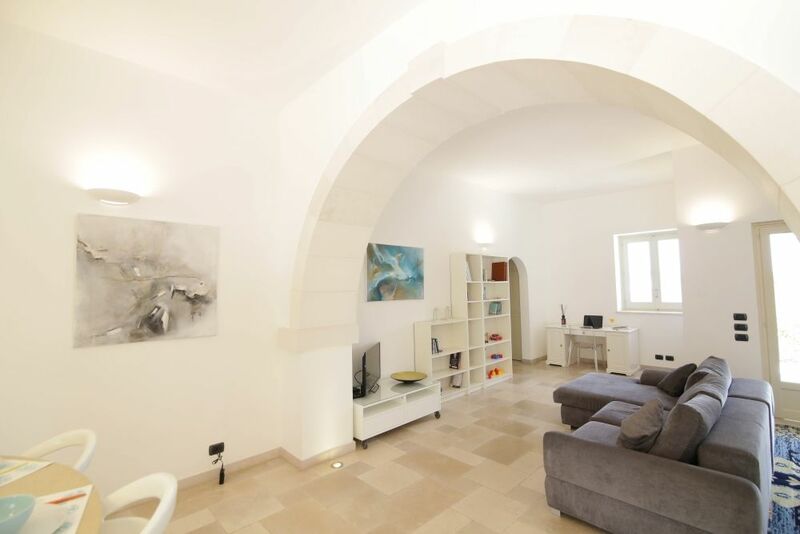 The location is fantastic - just 10-15 minute drive to the lovely towns of Martina Franca and Cisternino and 30 mins to Ostuni. You definitely need a car - there is one local restaurant a 5-10 min walk away, but it hadn't opened for the season when we there (first week in July). As is normal in this part of Italy, it's difficult to get food earlier in the evening but the plus side was that everywhere welcomed children, no matter how late and as a large family group we were always made to feel welcome. Special mention must go Graham and Hayley who manage the villa. They were always on hand to quickly deal with any niggles (such as the wifi not working). Graham also went above and beyond, meeting us at the hospital a couple of times when the kids were sick and translating for us - we couldn't have managed without him. Overall, we loved it and I would very much recommend Villa Azzurra - I certainly hope we'll be back. 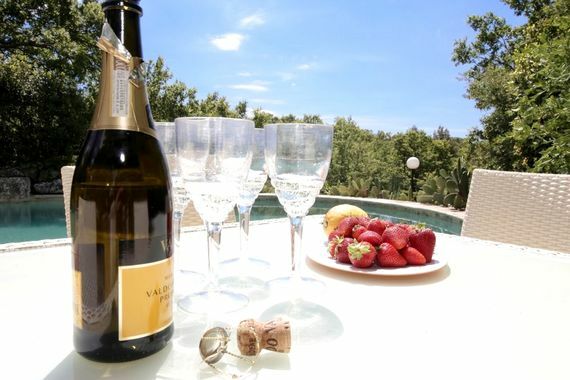 Villa Azzurra was absolutely wonderful and had everything we needed for our holiday. The villa itself was very light and spacious, and all the rooms were clean comfortable and very nice and modern. Having three bathrooms was also great and made it very easy for everyone, especially as we never seemed to have a problem with hot water running low or anything like that. The villa had a good selection of items for the babies, as well as books, games and films for everyone else. There was also plenty of equipment for the babies such as bowls, cups and plates etc. 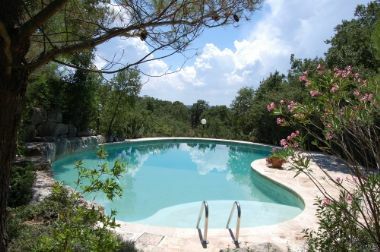 The swimming pool and surrounding area was also very lovely. I would definitely recommend getting out there early on in the day though as because of the pools position the sun goes behind some trees from about 4pm. The villa’s location is quite remote, so definitely not those who wish to be in the hustle and bustle or near restaurants and a town. 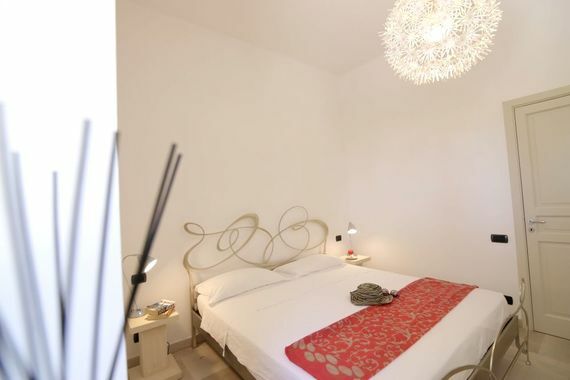 The nearest local town appears to be Martina Franca which is about a 15 minute drive away. The agent on our arrival was helpful and showed us the way to the local supermarkets and gave us lots of good tips on the places to go and directions etc. All in all it was superb!